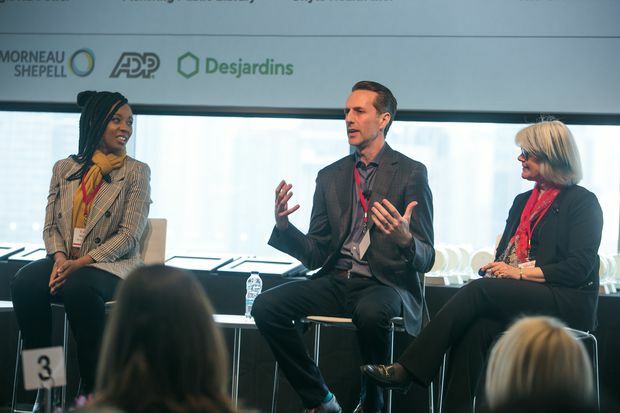 From left, panelists on managing employee stress and anxiety at the Solving Workplace Challenges Summit at The Globe and Mail centre in Toronto: Tanya Sinclair, chief engagement officer at the Pickering Public Library; Jason Tafler, founder and chief executive officer of Unyte Health Inc. and Shelley Parker, an industrial psychologist with NB Power. Jason Tafler had the scariest wake-up call one could have at work. Trim and health conscious, he was a driven corporate executive, working 80 to 100 hours a week, rising to become executive vice-president at Rogers Communications. It was one in a number of successful positions he had over two decades in high tech and high finance. He was hard charging, a workaholic, he now says. “I was known as a machine, in terms of getting things done. I didn’t realize the effect that it was having on me and my body,” he said. Then, three years ago, at a morning work meeting, he began turning yellow. “I started having internal bleeding, and I was rushed to the ER … and I basically almost bled to death. I had four blood transfusions, lost half my blood volume. I was very lucky to get out of there, and kind of had some epiphanies in the hospital,” he said. He was 40 at the time, and wondered whether he would live to see his son again. The diagnosis was Crohn’s, an inflammatory bowel disease. He quit his job and took a year off to recover and regroup. 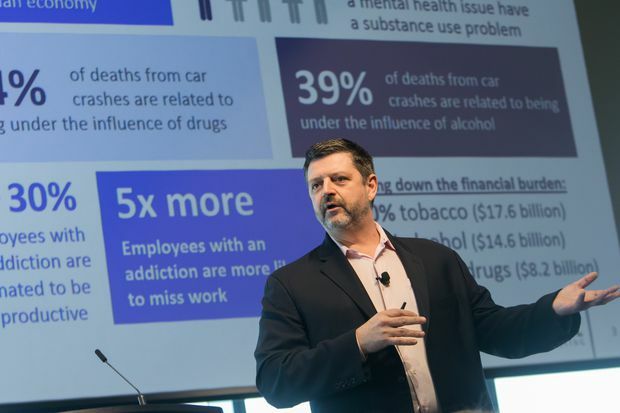 He has since started a health-focused technology company, Unyte Health Inc., and advocates for a more mindful work-life balance, relaying his story at a panel discussion during the Solving Workplace Challenges Summit at The Globe and Mail in Toronto on Tuesday. “I had been climbing this ladder the whole time, but I really wasn’t that happy, and ironically I wasn’t that healthy,” he said. The problem, he said, arises when businesses blindly pursue results, rather than focus on the welfare of employees and customers who will deliver those results. It is important for employers to take the time to ask employees in a meaningful way how they are feeling. “I’d say that if you want to get the most out of your people, and make sure that they are productive, happy and healthy, then that’s probably where you want to go,” he said. Another panelist, Shelley Parker, an industrial psychologist at NB Power, noted that the electric utility in New Brunswick has had safety problems any time there were concerns among employees about the company’s ownership and organizational changes. Dangerous incidents increased when NB Power was split into separate divisions, and they spiked again when the utility was merged back into one entity. A proposed sale to Hydro-Québec was also a fraught time, with safety incidents once again rising. During times of change, employees feel vulnerable, she noted. They still do the work, but with less thought. “I went to the executive, and I said, ‘Do you know what? What’s happening is that they are on automatic pilot here,’ ” Dr. Parker said. Employees were too distracted about the future of their jobs. So, she introduced mindfulness practice and breathing techniques at the company. Despite the stereotype that hard-hat crews wouldn’t take to breathing exercises (and despite initial skepticism from executives), Dr. Parker found that the crews were very willing to gather their thoughts through mindfulness practice as a way of focusing before a job, before sending a worker up in a bucket to fix overhead wires. The policy was introduced around the time of Hurricane Arthur, which devastated the New Brunswick power system in the summer of 2014. As the executives fanned out across the province to help oversee repairs, they took this new policy with them, helping to stem safety problems faced by work crews during the massive cleanup. “It is our responsibility to know how employees are feeling. We make it the responsibility of the individual crews, the individual work groups, because we’ve embedded concepts of mindfulness and emotional health, psychological health into the actual work processes,” Dr. Parker said. However, when work conditions don’t change, when employees feel stuck, and things feel out of their control, that is when negative behavioural patterns or even addiction may seep in. These patterns may not involve drug or alcohol abuse, though. Compulsively reaching for the smartphone in your pocket can be just as problematic as a hip flask. It can become a crutch when caught up in emotions, rather than addressing a problem and dealing with the stress. “[With behavioural patterns] they are trying to change their state, and they see a rewards system start to get anchored,” Dr. Howatt said. What, then, should managers do to help an employee in danger? Some solutions might be as simple as not serving alcohol at company functions, or at least serving non-alcoholic drinks that are more than merely bottled water, in order to allow someone avoiding alcohol to feel included. Employers need to understand that work functions can be stressful, even terrifying experiences for people with addictions, said panelist Julie Irving, a psychologist at Toronto’s Centre for Addiction and Mental Health. Creating more of a sense of inclusiveness doesn’t need to cost much. Dave Reddy, vice-president of human resources at Lifemark Health Group, which has physiotherapy clinics across the country, noted that, for his company, an easy perk is to encourage employees to use the company’s own physiotherapy services, its core business. More than merely building morale, perks and employee assistance programs address serious issues of retention, and focusing on retention concerns can move the conversation from psychology to business strategy, Mr. Reddy said. When you talk about retention, that’s when employers react and "the business responds. So retention management is something we’re going to focus on in 2019,” Mr. Reddy said.